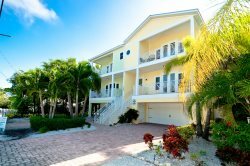 Convenient location in the heart of Anna Maria Island. Sleeps 4 and just steps from the beach! Community pool. Beach View outdoors. Kitchen Kitchen & Dining area Dining area. Kitchen Master Bedroom Master bedroom. Master bedroom Master bedroom Bathroom with walk in shower Outdoor area. Private Lanai. Enjoy the outdoors on your Lanai. Bedroom with two twin beds. Bedroom with two twin beds. Bathroom Outdoor Lanai area Lanai area. Pool area. Parking area. Entrance. Relax in your comfy living room. Watch TV Living room area. Living room area. Kitchen Enjoy our gorgeous beaches. Enjoy our gorgeous beaches. Looking for that tropical island getaway? Look no further – this lovely, light and bright two bedroom, two bath condominium is calling your name. Located on beautiful Anna Maria Island in Holmes Beach, the free trolley stops right in front which makes shopping and dining a breeze. This condo has two balconies, one on each side of the home with access from each bedroom. Just a short walk through the park to the beach, shopping, restaurants and so much more.